Rolling hills with big trees and canopies. Water, sidewalks and parking lot OB. Large tees. Very safe - police right on property. Dual pins. #7 and 9 are extremely long. Handicap league ($5) on Sat. at 9:30 am. I-75; exit #257 onto Hwy 60 east to a left on Lakewood Dr. Go through 2 lights to the park on the right. Nine holes though extra tee pads make a case for calling it 18. Very busy on the weekends. Really a putter course, only a couple of spots where you really have an option to throw hard and then low ceilings come into play. Great for beginners. Just a case of nine holes being squeezed into a small area. Course is kind of boring and doesn't really flow well, especially in the 5-8 hole range. 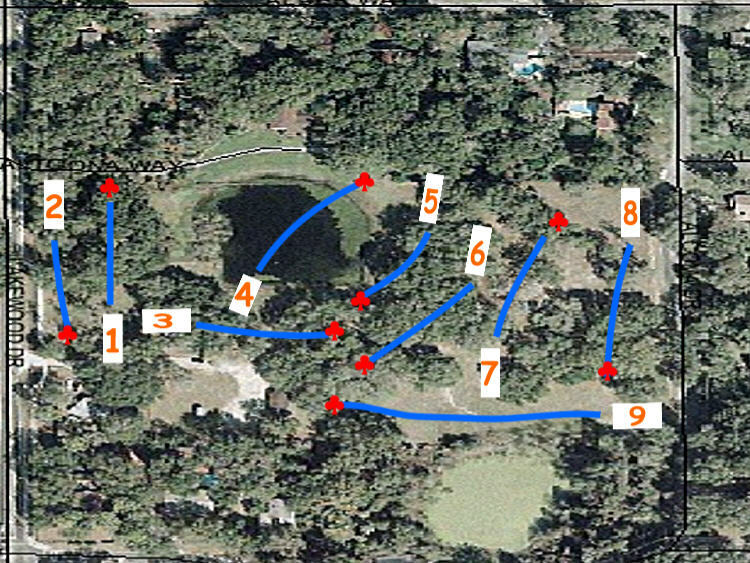 I like holes 1, 4 and 8 (I think) as they have interesting drives with some elevation changes, but it isn't worth the drive for me. If I lived nearby I might play it more often, but if I'm going to drive that far there are much better options in the bay area. Posted for maxx 852 "I can't believe I wasted my time. Tee signs have no directional markings, half of the tees are made of cinderblocks. If you live anywhere in the surrounding areas, play at Edward Medard Park in Plant City, just off of Hwy 60." Limona is a well maintained course located in a valley, which gives the player a variety of elevations to contend with. The course is moderately challenging, the hazards include trees in the fairways and one small pond. Each basket has two tee pads, one for the front nine and one for the back nine, so two players may be throwing at the same basket at the same time. This causes confusion on busy days. Fun course, decent birdie opportunities throughout. Play the big concrete pads for the front nine, smaller ones for the back nine. Bug spray is not a bad idea.